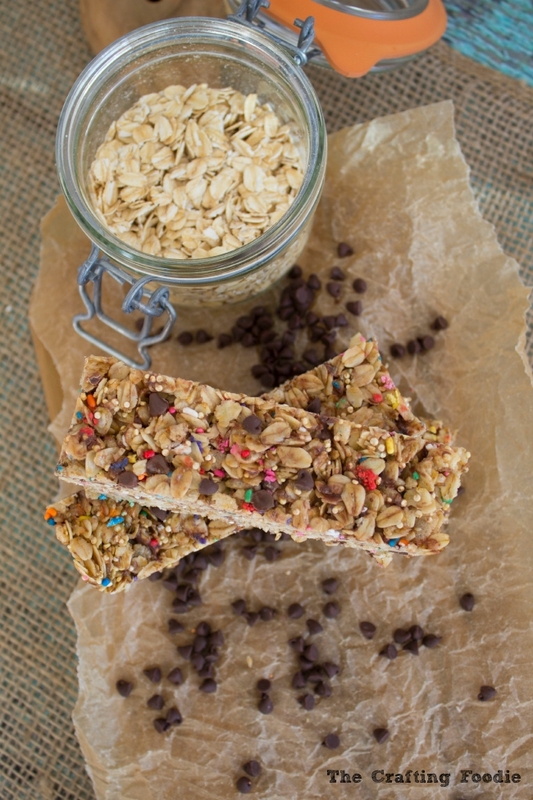 A classic lunchbox treat gets a healthy makeover with my version of Healthier Chocolate Chip Chewy Granola Bars. These chewy granola bars are made with rolled oats, quinoa, and flax seeds. Giving these Healthier Chocolate Chip Chewy Granola Bars an extra boost of protein, nutrition, and fiber. Growing up, my parents didn’t really give us access to junk food. I was always so envious of my friends and cousins who had a junk food drawer or pantry in their houses. I would dream about what I would put in one of those treasure chests of sugar and fat. I distinctly remember thinking that I’d always keep it stocked with Doritos, Oreos, and peanut butter cups. Without the traditional bags of chips and sacks of cookies, I would savor anything that resembled junk food. And my favorite was always chewy granola bars. My mom would get a combination pack, and the chocolate chip ones were always the ones to disappear first. So when my kids tried chocolate chip chewy granola bars, I wasn’t surprised that they love them just about as much as I do. After buying an organic brand of chewy granola bars, I thought, there has to be a way to jack up the health factor in these puppies. Yes, they’re made with rolled oats, but they’re also packed with crisped rice cereal (which isn’t bad, but not really that nutritious). After a bit of experimentation, I found the perfect formula. These Healthier Chocolate Chip Chewy Granola Bars are packed with rolled oats, quinoa, and flax seeds. 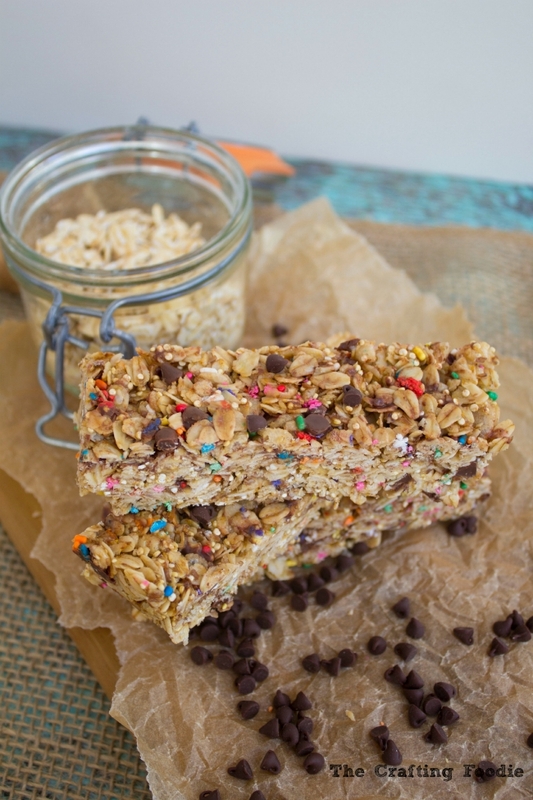 If you have any granola bar fans in your house, give this healthier version a try. I think they’ll become a permanent fixture in your snack drawer! While the oven preheats, prepare an 8 by 8-inch square pan by lining it with parchment paper. In a medium bowl, mix the puffed rice cereal, quinoa, ground flax seed meal, and salt. Set the bowl aside. On a large sheet pan, spread the rolled oats out in a single layer. 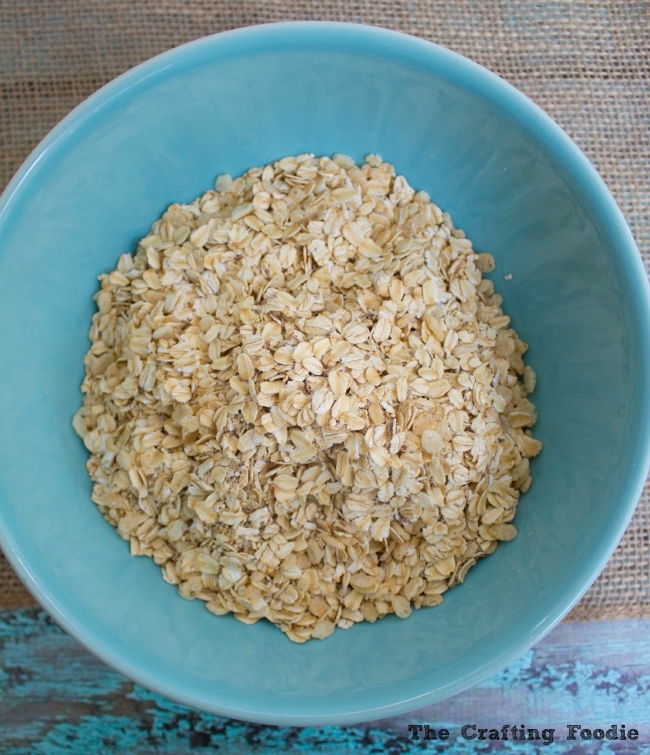 Bake the rolled oats for 3 to 5 minutes or until they are lightly golden. Oats can burn easily, so keep a close eye on the rolled oats as they roast. Once the oats are toasted, remove them from the oven and allow them to cool. While the oats are cooling, place the oil. honey, and sugar in a sauce pan. Bring the mixture to a simmer and allow the sugar to dissolve completely. Continue to simmer the mixture for 2 to 3 minutes. Remove the pan from heat, and add the vanilla. Set the honey mixture aside to cool for a few minutes. Mix the cooled oats with the quinoa mixture. Pour the honey mixture with the rolled oats mixture. Mix until combined. Before adding the chocolate chips and sprinkles, allow the mixture to cool until just slightly warm to the touch. Mix in the chocolate chips and sprinkles. Pour the mixture into the prepared pan. And flatten the mixture into an even layer using your palm or the back of a spatula. To get a crisp, clean cut granola bar, refrigerate the tray for an hour before cutting. Thanks so much, Anu! You’re so sweet 🙂 Yes, I love that the bars are no-bake, and the extra nutrition is a huge bonus! 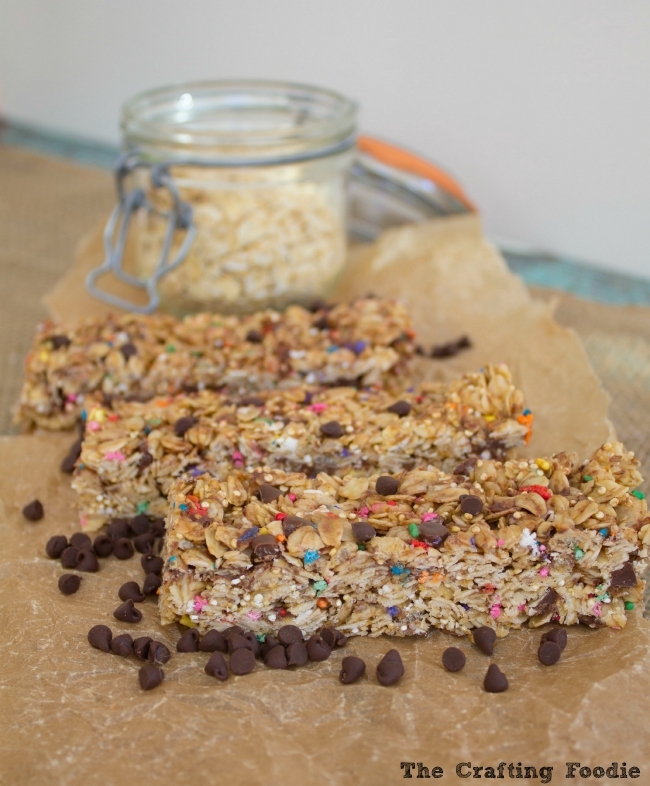 I just love no bake granola bars they’re the best! I made a batch last week hope to share in the upcoming week or so. Thanks for sharing Aida! just wanted to clarify-the quinoa is uncooked, right? Isn’t it hard to chew when it’s uncooked? Thanks! These sound amazing! Thanks for sharing. is there an alternative to coconut oil? That’s not something I have on hand and was just curious if it would be possible to use something else?